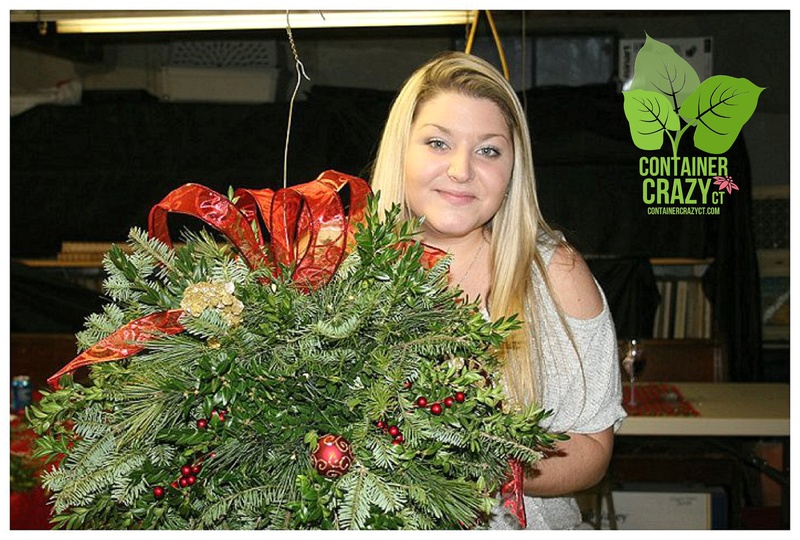 "Combining Nature with Art and Container Gardening"
How Do You Decorate for the Holidays? We just got through Halloween, and now, Thanksgiving Day is quickly approaching. After that it will be Christmas – as we all know! Some of us do not like to be rushed into the holidays – and many don’t care for seeing the decorations a little too early at the retail stores either. But because my work involves planning events and classes to learn how to dress up the home for the holidays with evergreen decor and more, my decorating starts rather early, and so does information about upcoming holiday crafting classes. 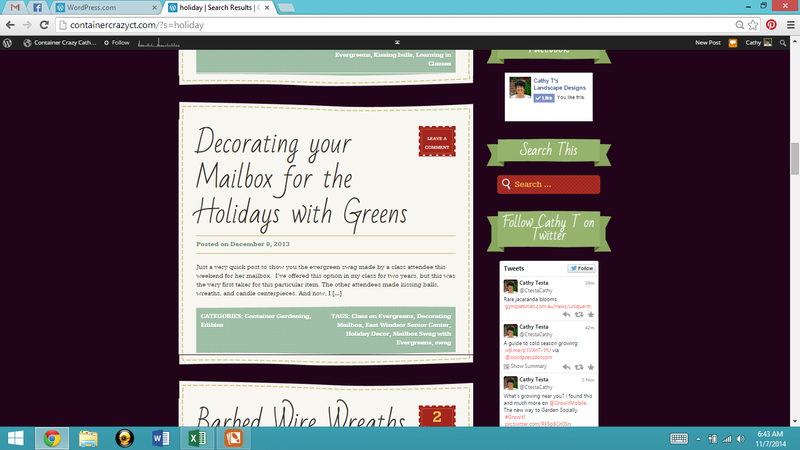 To see some of ContainerCrazy CT’s blog posts on holiday decorating, just go to the red search bar on the right side of this blog and type in Holidays. You will see results of ideas for decorating pumpkins to using mesh ribbon to create holiday decor in and outside the home, and of course posts about the annual class held by Cathy Testa of ContainerCrazyCT on making evergreen creations in December. Look for photos there, or by going to the top of the blog page for Cathy T’s Classes menu. Large Full Size Kissing Ball created by an Attendee! 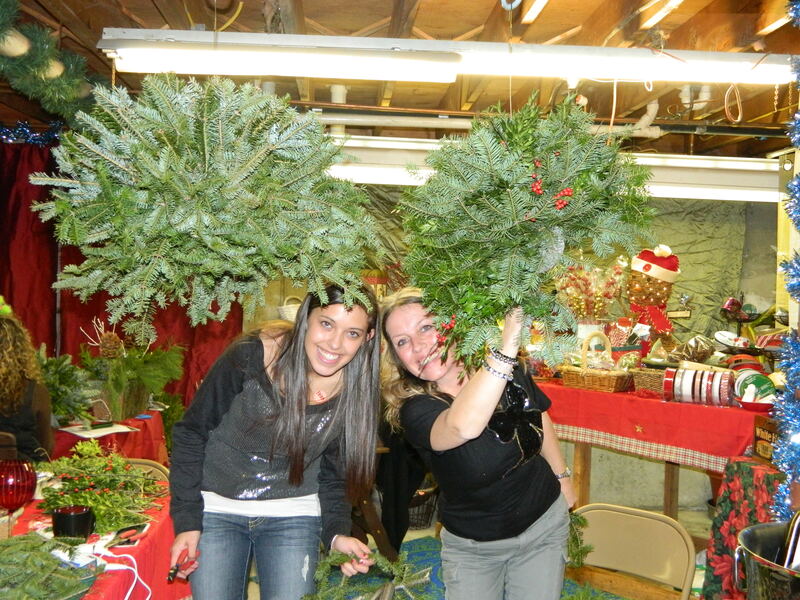 For those who have not attended this class before – Well, let’s just say it is a “Do not miss type of event” if you enjoy creating with FRESH greens — and a large variety of them – There will be 14 different types of evergreens to work with when you make your holiday decor item of choice. A large or regular size Kissing Ball to adorn your front steps, a Wreath to hang on your door, a beautiful long and wide Candle Centerpiece for your holiday table, or even a Mailbox Swag to drape over your mailbox with beautiful, colorful and fresh evergreens. As I prepare for this event, I start going thru my holiday decor to dress up the house. It includes tossing out old holiday decorations too – or donating them to Good Will, thus me tossing out an old tree! But the goal is to make the environment as festive as possible and to provide more space for our growing group of KB Makers in Cathy T’s classroom located in Broad Brook, CT.
Cathy T tosses old decorations out the window to prepare for new festive decorations! Image courtesy of Bitstrips. In a way, offering this class makes me get started a little bit early for the holidays – it puts me in the spirit. Just the act of taking out decorations made me want to open a bottle of wine! And because it is offered early in the month of December, it will get you into the spirit too – your decor will be enjoyed all month long before the hussel and bussel of the holidays. The class is about 4 weeks away, on Saturday, Dec 6th. So, if you haven’t pre-registered, now is the time. Join a great group of KB Makers, a festive environment, light snacks provided by attendees, and some festive beverages. All while learning how to make your creation of choice with evergreens. Visit www.ContainerCrazyCT.com and fill out the contact form or reply here at containercathy@gmail.com. To confirm your seat after pre-registration, a check must be mailed for the item you wish to make at class by next week, so don’t delay. Once registered, you receive full details. In the meantime, I will be also focusing on preparing for Thanksgiving (only one week before this class), and a Container Gardening Design class I’m teaching at the Tolland/Vernon location for the Master Gardener’s Program. The Nov 19th evening class is open to anyone. To learn more and register, visit http://mastergardener.uconn.edu/wp-content/uploads/sites/703/2014/08/AMG-F14final.pdf. Note the MG Container Gardening Design class indicates a Sept date in the above PDF link, but it is on Nov 19th, Wednesday. Monitoring Your Seeds (Part II of Seed Starting Sessions): April 13 (Saturday at 10 am or 1 pm) or by Appointment. Plant Starter Sales at Cathy T’s – Starting the week of May 20th (tomatoes, peppers, elephant ears, and canna lily starts) for your gardens and container gardens! Plant Gift Sales – Always available by appointment. Text to inquire or visit Container Crazy CT on Instagram to see photos always being posted of her unique creations for sale. Private Sessions by Appointment – Want to learn one of the topics above one-on-one or with a small group, teens, or others – Contact me to inquire. At Your Home Workshops – We offer some topics at people’s homes (terrariums, succulents, etc.). Mini Succulent Pumpkins – At the Ellington Farmers Market on Sept 28 (Saturday). All workshop details are posted on www.WORKSHOPSCT.com where you may register and find links to pre-pay. Enter your email address to follow this blog and receive notifications of new posts by email. And because, as a Blog Follower, you will not miss new workshop postings. Details of these trends to be posted about soon! When I play white noise in the house, what is my cat thinking? How many Fridays until Christmas? Check venue location for specific hours by visiting websites. Contact us anytime! For Broad Brook visits, call for appointments. See schedules for workshop dates.